From San Francisco Call, Volume 98, Number 100, September 8, 1905. 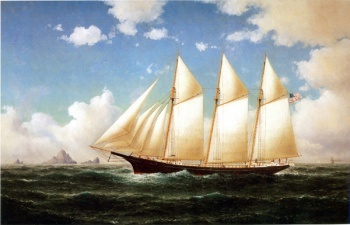 J. M. Colman (#76717) (1888-1905), a 157-foot wood-hulled three-masted schooner built for the Pacific lumber trade in 1888. 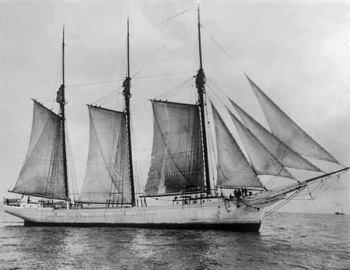 Named for Scotland-born James Murray Colman (1832-1906), businessman in the Pacific Northwest, she was built in Washington by the Hall Brothers, also the builders of Comet and Dora Bluhm. On September 4, 1905 en route from Washington to San Pedro, California with 800,000 feet of lumber, she ran aground just inside Point Bennett in a dense fog. The mate on the Colman, Hans Mailborn was drowned while trying to salvage a “chest of gold,” and it was reported he may have been gotten by a devilfish (giant squid). 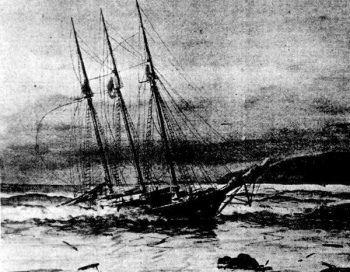 Unable to be saved, the Colman was eventually pounded to pieces on the rocks by heavy swells. Captain Vasquez and the Nidevers salvaged some of her lumber cargo. The Nidever brothers built a cabin at Willows on Santa Cruz Island with salvaged wood. John Russell, resident manager of San Miguel Island for Captain Waters, salvaged enough lumber to build the 120-foot long ranch house later called Rancho Rambouillet. Burros hauled the wood from Point Bennett to the ranch location above Cuyler's Harbor. Construction of the house was completed in 1908. [Eaton 1980: 24, 38, 89]. According to later island lessee Robert Brooks, Colman also carried flower in twill bags, which when wetted, sealed their contents. The flour was used on the island for many years. As late as February 1907, Captain Vasquez salvaged a load of lumber from the wrecked Colman aboard his boat Peerless, followed by an additional salvage of 150,000 feet of lumber aboard his Gussie M in July 1907. October 5, 1905 [LAH]: “The steam schooner Marshfield is here discharging lumber saved from the wreck of the J. M. Colman, which went ashore a month ago at San Miguel Island. The Marshfield brought 300,000 feet of the lumber, and a like amount together with the schooner will be lost. This page was last edited on 29 April 2017, at 17:08.